And of course, whatever it does, the West is trying to destroy the greatest leaders of the anti-Western and anti-imperialist coalition: Russia and China. The West needs to rule. It is obsessed with controlling the world, with feeling superior and exceptional. It is a game, a deadly game. For centuries, the West has been behaving like a fundamentalist religious fanatic, and its people have never even noticed that their world views have actually became synonymous with exceptionalism, and with cultural superiority. That is why the West is so successful in creating and injecting extremist religious movements of all denominations, into virtually all parts of the world: from Oceania to Asia, from Africa to Latin America, and of course, to China. Western leaders are ‘at home’ with Christian, Muslim or even Buddhist extremists. Recently, in Syria, near the frontline of Idlib, two top commanders told me that they are fighting “not only for Syria, but for the entire oppressed world, including Venezuela.” They clearly detected that the West is using precisely the same strategy against Caracas, which it tried to use against Damascus. 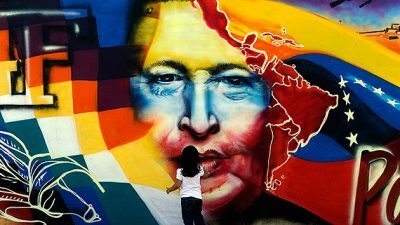 Venezuela cannot fall, for the same reasons. It is at the northern extreme of South America. Below, there is an entire continent; terrorized by Europe and North America, for decades and centuries: brutalized, plundered, tortured. South America, where tens of millions used to be exterminated like animals, forced to convert to Christianity, robbed of everything and ordered to follow bizarre Western political and economic models. Russia has already showed what it can do for its Arab brothers, and now is demonstrating its willingness to support its another close ally – Venezuela. It is about the West being able to close access to the Panama Canal, by Chinese ships.